Rune healing is not as common as crystal healing or other psychic healing process but it works wonder and can give significant changes into a miserable and lonely life of someone. So, Do you have a problem to make a decision? Don’t you know what should be your next step? Can’t you predict the consequences of your action? We will help you to look into your possible future and we will accompany you in the process of decision-making. Try to imagine how many things you would do differently, if you knew their consequences beforehand? That is exactly what we will help you to make real. Remain modest – that is the right of the oracle. Be in the world, but not from the world. Stay receptive to impulses, that come out of the divine in the inner and outer sphere. Seek to live the usual life in an unusual manner. If you take the ‘itself’ rune and cut through it in the middle, you are going to receive the rune of joy and its reflection. So there is a fine warning not to be careless. The acrobatically dancing energy of the balance is asked here to bring its higher itself. Nothing in the excess – that was the second request that was to be read at the entrance to the delphish temple. The first advice read: Recognize you yourself! Fehu is the rune of fulfillment: ambition satisfied, salary received, fulfilled love. It also promises food, from the commonplace to the holy divine. This rune requires a deep exploration of the importance of profit in your life. Another aspect of Fehu is the conservation and preservation of what has already been won. Caution and vigilance are necessary, especially in happy times. Even if there is a reason for celebration, don’t be distracted by reckless bliss. This is the time of your ways separating. Old skin must shed, outdated relationships need to be given up. If this rune appears, a “molting” is necessary. Othila is a rune of the radical separation. Obedience and probably also withdrawal is necessary – to know, when and how you need to withdraw, and to actually have the determination, to do it. Property is also an aspect of this rune, because Othila is the rune of the acquisition and profit. The profit however, that “heir”, which you receive, could likely be made of something that you need to abandon. This process can be especially hard if that what needs to be abandoned is something of your cultural heir and backing. Not ‘rigidly’ but rather like a ‘river’ is the correct attitude to have. And yet – you have to wait that the universe begins to act. Deep, inner trans formative powers are interacting, but what you are going to get out of them isn’t easy to recognize. An integrity – concealed, disguised, secretly hidden. After all, what is going to heal us and our soul is a deep mystery. On the side of the material world there probably will be surprises; unexpected profits are nothing to be excluded. Nothing less than a renewal your spirit is the risk you take. The old way found its end: You simply cannot repeat the old things any longer without suffering. However, you always have a chance: Either you see all negative as a “misfortune”, or you recognize the entire as a hindrance stretch, an inaugural way that you have to follow at this moment. Our lesson is the necessity of bearing strong enforcement. Your positive aspects can be controlled by the people who surround you. To pull this rune means to get a hint that there is going to be stagnation – an occasion to re-consider your plans carefully. It is the time to pay off old guilt and even if it’s easy it is time to restore balance. Therefore improve, reconstruct, organize: if the fishermen cannot pull out, they repair their fishing nets. You must deal with and face your own demons. So keep your anger as well as your impulses under control. Modesty and a good mood are essential in such times. This is about the control of emotions. During transition periods, changing the course of life and accelerated self-change, it is important not to rush into emotions, either positive or negative. Remember that early action and right conduct are the only real protection. No matter whether your business flourishes or fades, don’t worry. Maybe you don’t win, but you will never lose, because you will always learn from what has happened. Moderation and civility are the strengths of the protective forces of this rune. The keyword is receiving – messages, signals, gifts. Even a timely warning can be received as a gift. If the messenger rune brings holy knowledge, one is probably blessed. Put effort into every meeting, visits and accidental encounters, be especially attentive and aware – in particular with people, that are wiser than yourself. In the opposite situation, Ansuz says: Think of the positive aspects of the unfortunate. Jera, eine Rune des guten Gelingens, bezieht sich auf jede Aktivera, a rune of good success, refers to any activity or effort you devote yourself. To see this rune is an encouragement to remain in good spirits. But you should know that quick results cannot be achieved. A period is always associated, therefore the keyword “one year”, which stands as a symbol for the full cycle of time that is before the harvest or exemption/liberation. Change, freedom, invention and caution are attributes of this Rune. To pull it indicates the existence of an urgent need in your psyche to free itself from the confines of identification with material reality, and to experience the world of archetypal thinking. The Rune of elementary destruction and of things that are completely outside your control. Hagalaz is only upright, not vice versa, and yet it always works through the reverse. If you pull this rune, you can expect resolution, because it is the big ‘awakening. The more serious the damage is in your life, the more important and contemporary are the requirements for your further growth. This rune stands for wholeness – so for that which our body needs. It embodies the impulse for self-knowledge. As a great power rune Sowelu shows that the life force can be available for you and that there is a time to recharge and regenerate again. Here again a warning of being too cocky. Meditate on Christ’s words: I can do nothing of myself. From our own strength we cannot do anything. Empty is the end, empty is the beginning. Like the phoenix from the ashes it rises – from what we call fate. The surrender of control is the supreme challenge for a spiritual warrior. If you drag the blank rune, take courage. Trust that the universe will make self change in your ongoing life progress. Older than the New Testament, the runes lied broken for over 300 years. Most recently they were in use in the late Middle Ages in Iceland. They were transformed from the Tarot and the Chinese Book of Changes and were used as the I Ching of the Vikings at that time. The influence of the runes on their time was undeniable. Elliott writes that the tribal leaders and advisers of Anglo-Saxon England called their consultations, which they held in secret meetings, “Runes”. As Bishop Wulfila translated the Bible into fourth century Gothic, he used in Markus 4, 11 (“you are given the knowledge about the secret of the kingdom of God”) for the word runa “secret”. The rune masters and vikings wore striking clothes, which you could recognize easily. Adored, welcomed and feared at the same time, those shamans were familiar figures in tribal circles. There is evidence that a sizable number of runes experts were women. The detailed operation of a similar tradition is much older and is from the Roman historian Tacitus. In the year 98 AD, he reported on the customs of the Germanic tribes. 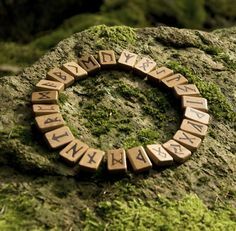 Although in later Anglo-Saxon period alphabets included up to thirty-three sign, the traditional Germanic Futhark script consisted of twenty-four runes. These were divided into three “families” of eight runes, it was said that the numbers three and eight, had special magical powers. The three groups (aettir) were named after the Nordic gods Frey, Hagal and Tyr. Odin is the chief god in the pantheon of Norse gods. His name is derived from the term for “wind” and “spirit”. Through his suffering, his self-sacrifice, Odin brought the runes to us. According to the legend, he hung for nine nights on the Yggdrasil tree, the world ash tree, wounded by his own sword and tormented by hunger, thirst and pain. He was alone and without any help, until he was near to death, then he he saw the runes and, with a last, mighty effort reached for them and got them.Translated from.